Just a quick post for you today. I am working diligently to get my apartment ready for company that is coming in on Thursday. It seems that I get one thing done and I think of two more that need my attention. It's a never ending battle. One of these days I'll get my mind wrapped around the fact that I just don't have room for everything in the world in my home. :-) Then again, that may never happen. 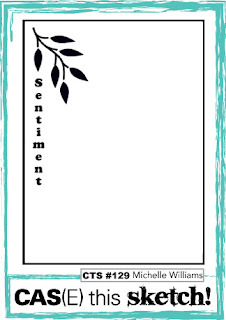 I'm a Stampin' Up!® Demonstrator who just keeps getting more stamps and more stamps and...well, you get the picture. 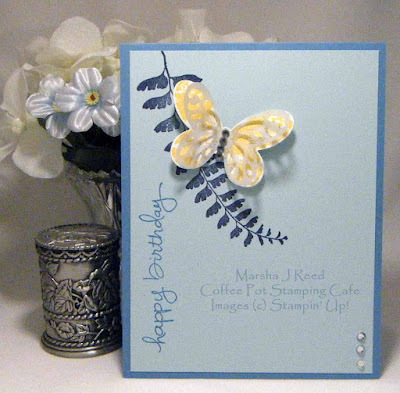 My butterfly was stamped in Daffodil Delight onto Whisper White and over that I added a Vellum layer that was cut using the Bold Butterfly Framelits Dies and lightly touched with some Night of Navy. It does not show up well in the photo but in real life it's a very pretty butterfly. Stamp Sets: Butterfly Basics, Endless Birthday Wishes; Inks: Daffodil Delight, Marina Mist, Night of Navy; Card Stock: Marina Mist, Soft Sky, Vellum, Whisper White; Accessories & Tools: Bold Butterfly Framelits Dies, Butterflies Thinlits Dies, Rhinestone Basic Jewels, SNAIL Adhesive, Dimensionals, Precision Base Plate (Sizzix), Stampin' Trimmer, Big Shot Die-Cutting Machine. 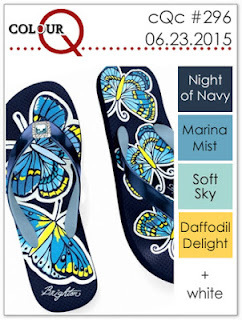 All Stampin' Up!® product unless otherwise noted. The colors I used are from the ColourQ Challenge. love how you combined these challenges Marsha - your card is so lovely and perfect for both! Thanks, Leigh. It was a wonderful sketch.